When the heat is on, stay cool with a frosty beverage. 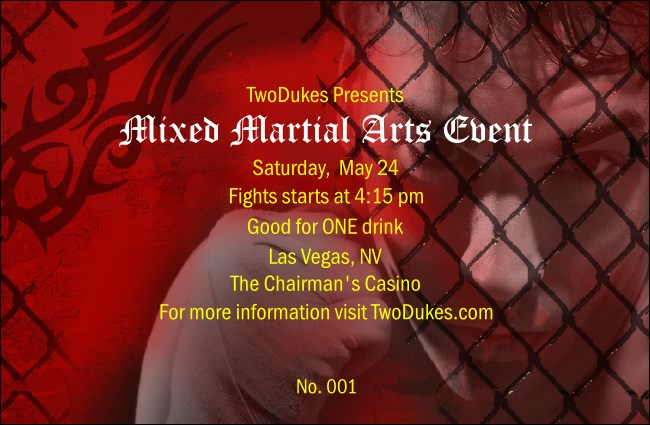 Drink Ticket for this red Mixed Martial Arts Event Kit features a fierce fighter with his game face on, contained behind a metal fence and a tribal tattoo design. Drink Tickets help you increase bar sales, reward fans in advance, and keep the drink line moving. Quench your thirst with Drink Tickets for every event from TicketPrinting.com.